EcoTraining Blog: Nature's clean-up crew! One of the many incredible facets of nature is its efficiency. Nothing goes to waste out here: a derelict termite mound can be home for a multitude of species from hyaenas to snakes and an old wasp gall provides the perfect home for a spider. But it is not just the recycling of real estate that makes it so special. Dealing with dead matter is a massively important affair. Without its processing, the risk of disease is very real as a decaying organism is the perfect breeding ground for some of Mother Nature’s more unsavoury organisms. To combat this threat, nature has given us a few select species that specialize in this area. They are the sanitation team of the bush and they love their job! The other day we found a dead hippo on the banks of one of the local waterholes. 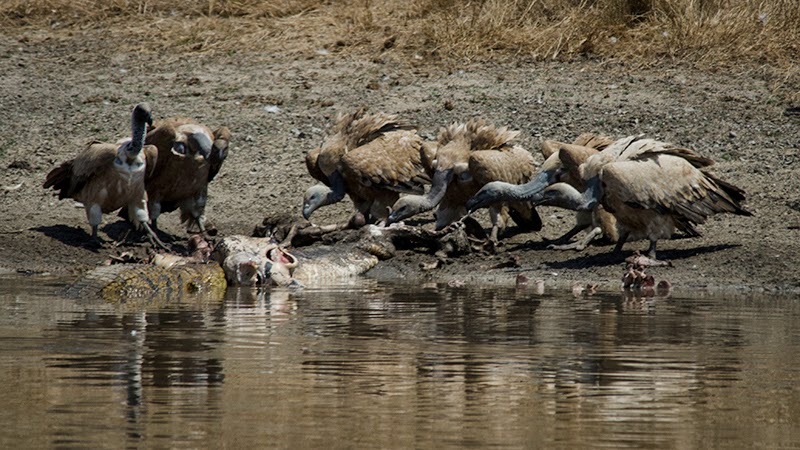 By the time we arrived on the scene the animal looked as though it had been dead for a few days and not much remained of the amphibious giant but its demise had already benefited a whole host of scavengers. 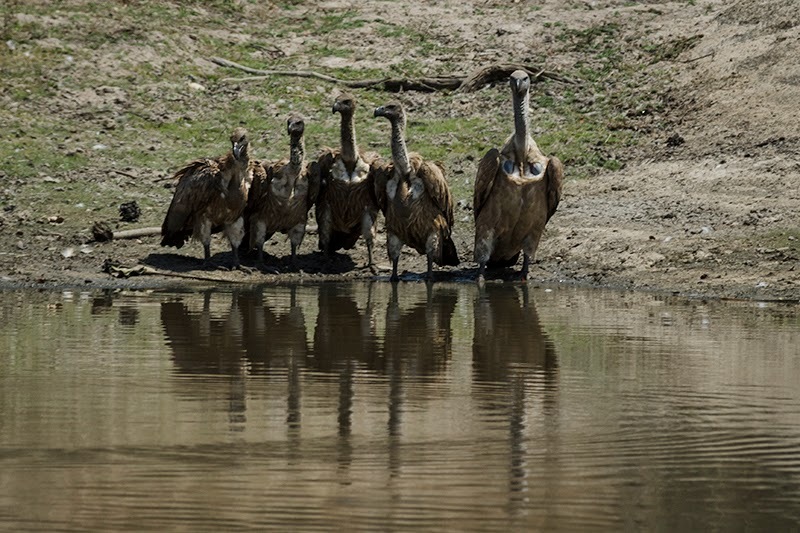 As we sat in the baking midday heat, the scorching temperatures did not seem to bother the wake of vultures that fought over the remaining scraps of nutrient rich flesh. With no regard for table manners, they entertained us for ages with their petty squabbling. Sharp bills stabbed at their fellow dinner guests and wings were spread in anger every few minutes as they tore strips of flesh to store in their crops for digestion later. 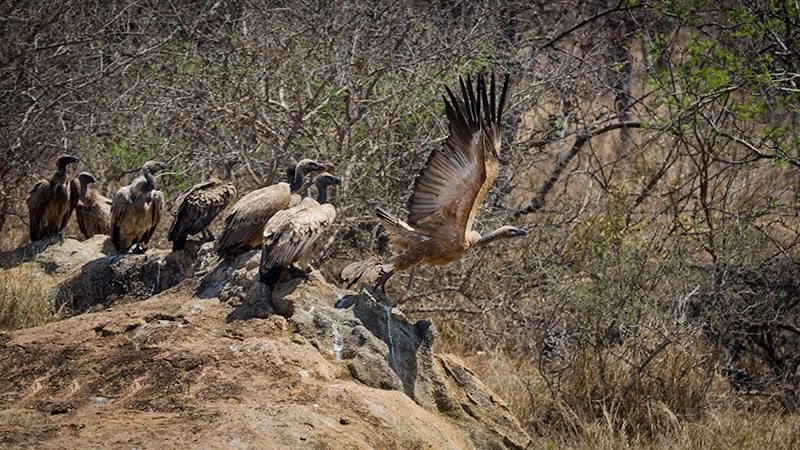 We were delighted to see that a large percentage of the raptors present were in fact Cape Vultures. This species, endemic to southern Africa is considered vulnerable in its status with estimates numbering less than 10,000 left in the world. 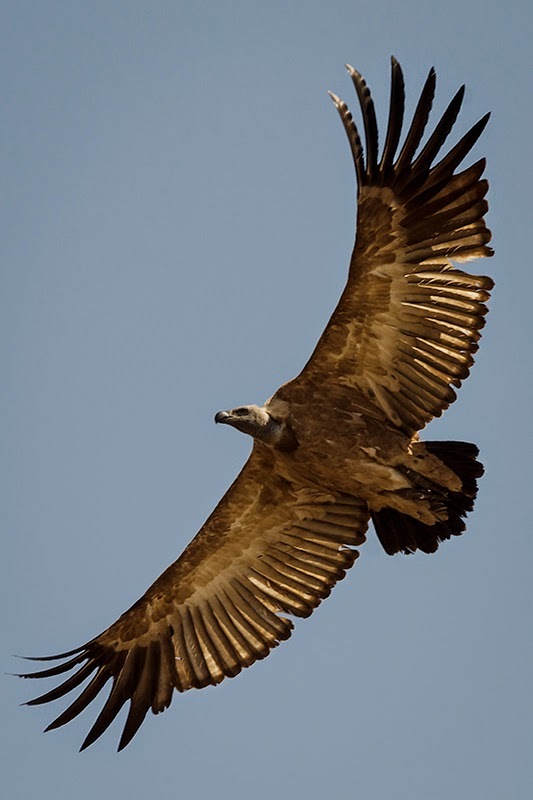 Unfortunately, the largest of the vulture family is under threat due to the traditional medicine (or ‘muti’) trade. Amongst other things, their eyes are especially sought after as they are believed to aid in foresight for the consumer. 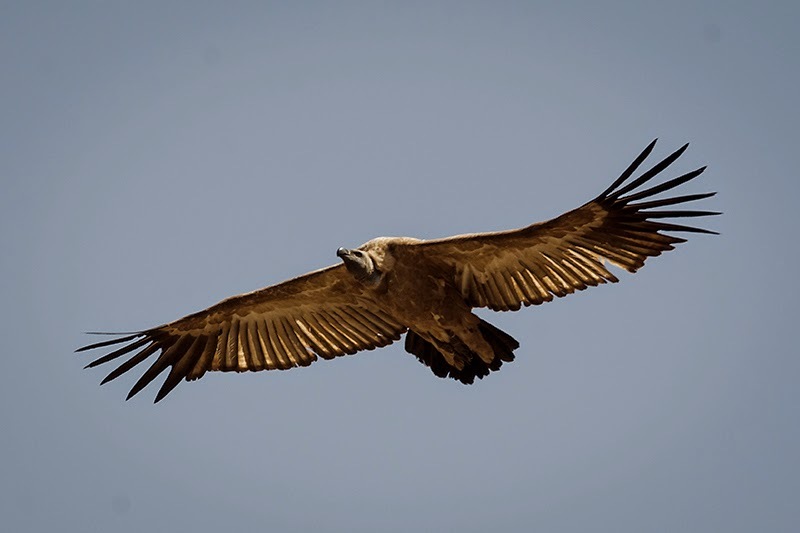 Despite their plight, the towering Drakensburg that watch over the Lowveld provides perfect nesting opportunity for this impressive bird and thus, numbers in this area are among the most dense to found anywhere within its range. 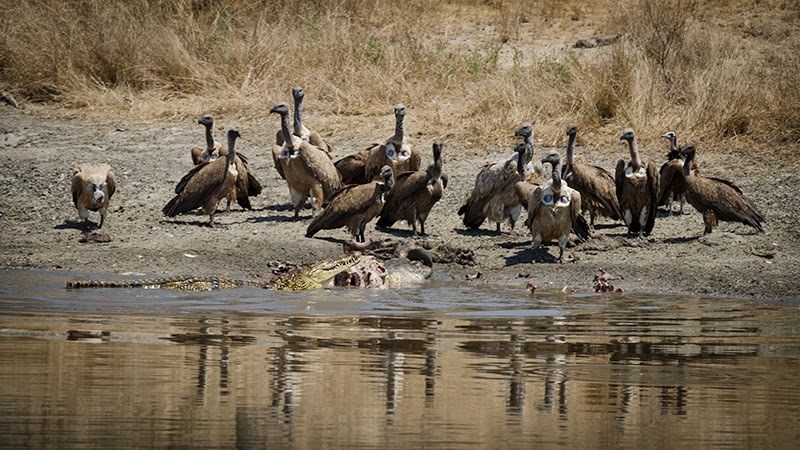 Whilst delighting in their meal, they always kept a careful eye on the resident crocodile. At about 3 meters long, it is not the largest to be found on the reserve but still a formidable adversary should one stray too close to its indiscriminate jaws! It lay in the shallows next to the carcass occasionally grabbing mouthfuls of decomposing flesh, twisting its streamline body violently to rip off chunks of meat to be swallowed whole. Such a meal will keep it satiated for months to come no doubt. Tracks of other scavengers litter the area with both jackal and hyaena spoor found in abundance. Despite their unsavoury reputation, nature’s clean-up crew perform a vital role within the ecology. It is incredible to think that a near 2 ton animal can be reduced to pile of bones in only a few days. 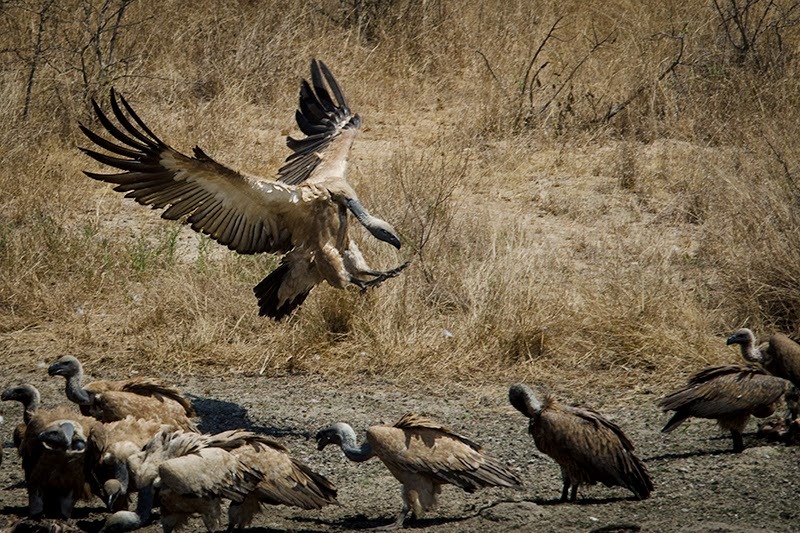 The way in which a carcass is systematically dismantled in such a short time is mightily impressive and with the help of the resident sanitation engineers, from hyaena to crocodiles, to vultures, to the humble ants, these vital nutrients will be put back into the soil ready to feed the next generation of organisms. It is one of many miracles of nature that everything has its place. Its efficiency is ruthless. There is almost no role that is not fulfilled in nature and its level of organisation is so far beyond our own self-proclaimed intelligence that our society pales into insignificance in comparison!